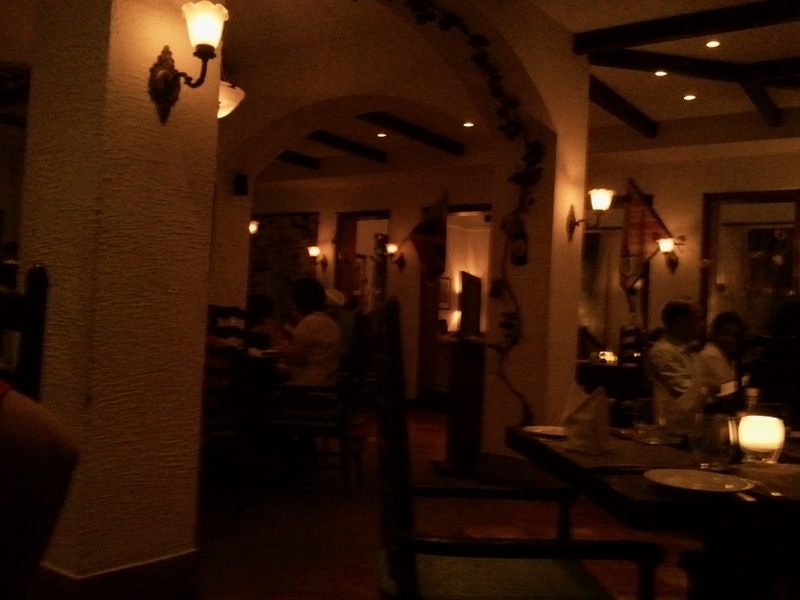 Romantic restaurant with excellent ambience & service, serves very good food but not the best in the category. Before the food is served, came the breads & a tiny bowl of dark green ‘Olive pesto’……. Simply awesome. For starters we had fairly good calamari aglio. 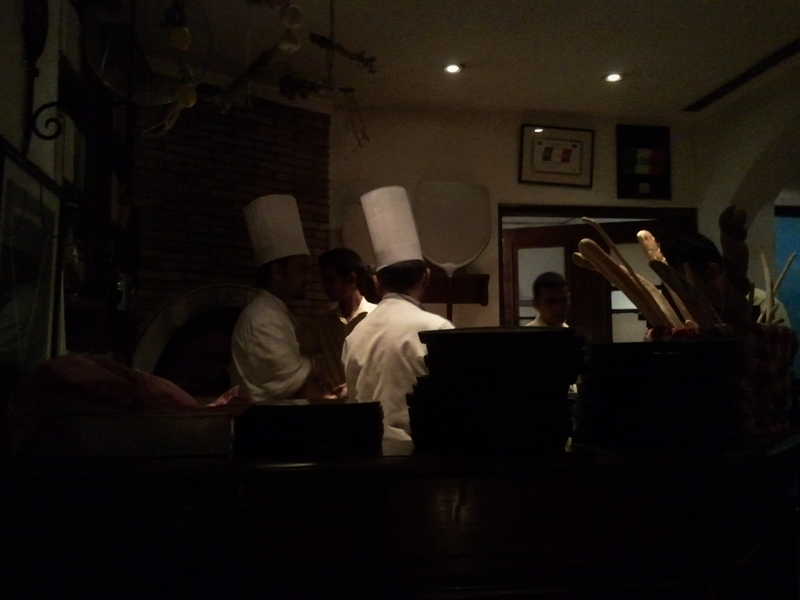 Then came the super thin crust signature Pizza – Provencale (vegetarian) baked on woodfire in a stone oven that u can see in one corner of the Dining Room of the Restaurant. Very good Pizza I must say, especially after we topped it up with some lamb salami, homemade red chilli flakes & oregano. The Grilled sole in Olive oil was good but have had better elsewhere. The Chocolate Lasagna dessert was again excellent with layers of not too sweet chocolate (with a slight hint of salt) amidst a non-fluffy chocolate cake, topped with Vanilla flavored ice cream. Loved the experience overall – Tastes r great but cud have been even better – prices r on the higher side. The starter had a really long name – Calamari aglio e olio pepperoncino – It was a finger-licking good dish of squid (also called Calamari) with olive oil, garlic & red chillies. Excellent taste overall but the squids were bit chewy – not as soft & almost melt in the mouth as the ones served in the sea food platter at Britto’s in Baga beach, goa (Britto’s Squids r the best I have ever had). Had a pleasant aftertaste …… flavorful, mildly hot & tangy. 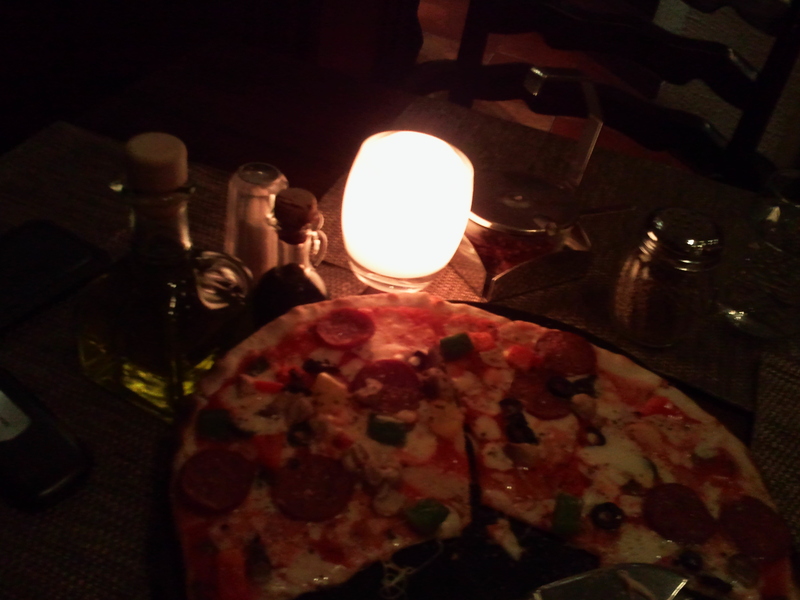 The Provencale pizza was a super thin crust VEGETARIAN Pizza with toppings of tomato, mushroom, tri peppers & mozzarella. We added smoked cheese & lamb salami as extras. While oregano was good, the Chilli flakes were outstanding…full of flavor & also taste… We asked & found the answer – The Chef & team dry the chillies themselves instead of buying dry chillies from the market. Overall very nice pizza but after much debate in the brain I conclude that the Primavera Pizza with pepperoni topping at Spagetti Kitchen is shades better than this. The ones at Hilton , Shankar Chowk , Gurgaon are surely better. We were very pleasantly surprised at the interactions with the very knowledgeable staff. They were readily offering extras & also suggestions – ‘I wud suggest that u do not mix up A & B coz they do not go well together’ …… and so on. Water was being refilled often & the guys were really paying attention without being intrusive. Grilled sole in olive oil was served with grilled veggies, some excellent olives & blanched spinach stir fried with garlic. Was good but I have surely had better. The fish seemed to be a bit dry. The Chocolate Lasagna had layers of rich chocolate amidst a soft, non-fluffy , rich cake. 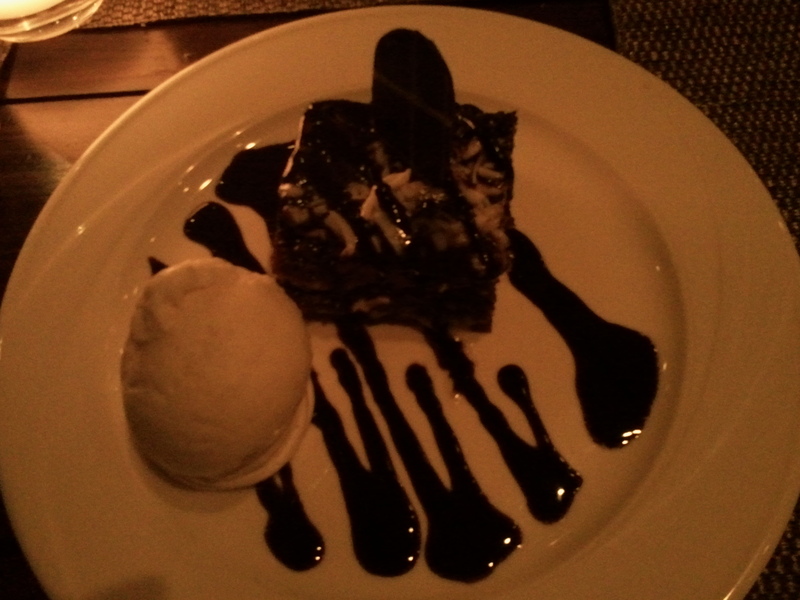 This was served with vanilla flavored ice cream – wud have been much better if it were the real vanilla ice cream. Overall – Was an outstanding experience. Prices r surely on the higher side if u talk just about the quality of food & the taste. We paid Rs. 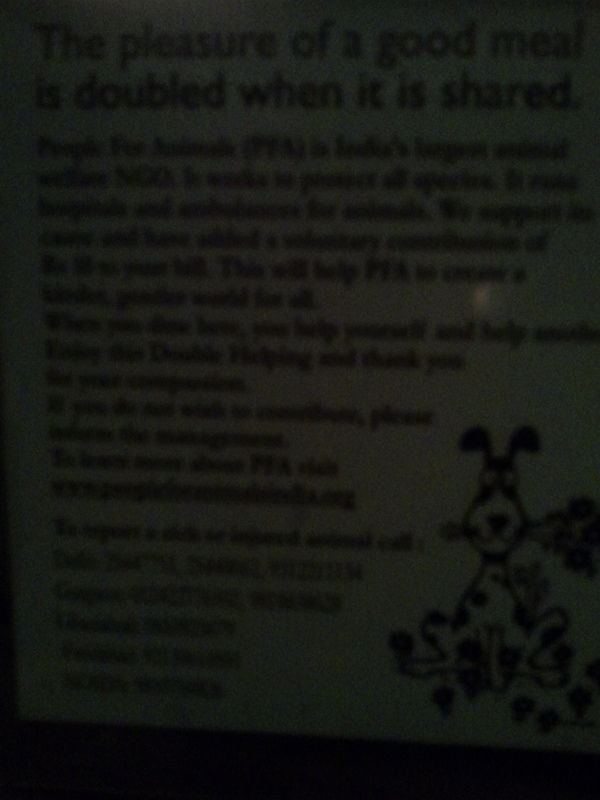 10 (there was option not to pay) for PETA to stop cruely to animals!!!!! ….. after a nonvegetarian dinner…. Hi, it is a free theme from wordpress. There r options 2 customize.